Flicks, Pics, Tix and Tunes — Geoff Wood, coworking guy. 1. Flicks - It seems to be a fairly crowded box office the last couple of weeks. I've probably written before that Hope and I are big movie fans(1) but it's been hard to get out and see everything that we (probably more "I" than "we") want to see since getting back from vacation. The movies we haven't seen: The Simpsons, Die Hard 12, Transformers. The ones we have: I Now Pronounce You Chuck & Larry and The Bourne Ultimatum. Looking at the list of "haven't seens" you're probably surprised at the first "have seen". Please understand that I'm a big Jessica Biel fan (crush) and have been since I gave up on my childhood crush, Kristy Swanson, making a come back(2). The comedy was okay - Sandler today is not the Sandler of old - but Jessi's mere presence made it worthwhile (anyone who's seen the preview knows you get to see a lot of Jessi, literally). The Bourne movie was very good (and Hope's choice, ah hem, Matt Damon). I remember before the first one came out I had a hard time picturing him as an action star (other than in Good Will Hunting 2: Hunting Season). He did a great job in that one and has in the last two, as well. However, the movie did do the cardinal sin of action movies (according to me): the totally inplausible car chase. I don't mind car chases - I just want realism. No, Will Smith in Bad Boys II shooting people out of the window as the car rotates 260 degreees and no Matt Damon ramming people with a squad car (and no seat belt) with no ill effects to his person in Bourne 3(3). 2. 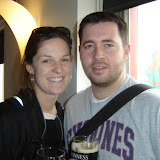 Pics - I was playing around with Picasa tonight and uploaded our Ireland photos from 2005. If anyone's interested (these are the same ones that I put on Yahoo! a couple years ago) though I didn't take the time to caption them. Click on the link below for the Dublin album and from there you can hit "public gallery" to see the other albums. 3. Tix - We got our Hello Dave/Cystic Fibrosis tickets in the mail this week. Excellent. Oh, and as I joking questioned several weeks ago, it turns out that $25 of each ticket is tax deductable! 4. Tunes - I got a DVD in the mail today from "an unnamed aquaintenance" that is the ultimate collection of every Nadas song ever recorded. It includes all albums they've released and every soundboard bootleg he could find in cyberspace(4). Between Hope and I we probably average 1.5 copies of each album but they aren't all in mp3, yet, so it'll be a convenient place to start. He mentions some guilt about potentially taking cash away from a band "trying to make it big" but I'm cool with it. After all, this band that used to play in our basement cost me $15 at the door the last time I had the chance (I think they owe me). (1)At one point early in our relationship we probably saw one picture show each week. (2)Walk on roles in Dude, Where's My Car? aren't going to make it happen. (3) I believe he was guilty of the same in Bourne 2 (4)Does anyone call it cyberspace anymore or did it go the way of "Information Super Highway"?